South Korea's president is in Washington. He will spend time tomorrow with President Trump. Their meeting is happening ahead of the high-stakes summit set for next month between Trump and North Korean leader Kim Jong Un. Since North Korea has threatened to back away from talks, South Korea is having to do deft diplomacy to keep the summit alive. NPR's Elise Hu has more. ELISE HU, BYLINE: Customers stream in at a steady pace at Club Espresso, a light-filled, two-story coffee shop nestled not far from the presidential Blue House in Seoul. Here, imported coffee beans are the specialty. On the bottom shelf of a wall display of beans are bags labeled Moon blend, named after South Korea's President Moon Jae-in. LEE YOUNG-JIN: (Foreign language spoken). HU: "Four or five years ago when Moon was a regular here, this was the blend he used to buy," Manager Lee Young-jin says. At the start of his presidency, the sales of this coffee spiked because word got out he was a regular. Now a year into office, coffee sales have returned to normal levels. But Moon's approval rating remains near 80 percent with a vast majority of South Koreans supporting his efforts to get a peace deal with North Korea. His April one-on-one time with Kim Jong Un is still fresh, so Moon is expected to share his read on Kim with President Trump. The Atlantic Council's Miyeon Oh says the allies have been coordinating throughout the spring. MIYEON OH: It is a way to assure that the United States and South Korea are aligned and there will be no differences between the two that can be exploited by Kim Jong Un. HU: South Korea's presidential office says this White House meeting will serve as a bridge to the next summit between Trump and Kim. But already, the path to denuclearizing North Korea is getting gummed up. Last week, Pyongyang threatened to cancel the summit set for Singapore, citing its objection to joint military drills in South Korea. And it rejected American calls for unilateral denuclearization. Miyeon Oh says this is because North Korea believes its nuclear arsenal means it deserves more respect ahead of talks or it could be just the usual Pyongyang playbook. OH: It can also be repeating pattern of North Korea's tactic of negotiations, which tends to drag the time until the last minute that they decide what they do accept and do not. HU: President Moon's now having to play mediator, using his years of familiarity with North Korea's tactics in Washington, where there's little trust in Pyongyang given past failures. Park Ihn-hwi is a professor at Seoul's Ewha University. PARK IHN-HWI: South Korean government, we know that. We fully understand such kind of tactical calculation of North Korea. We will have some problem, but the role of the mediator will efficiently continue. 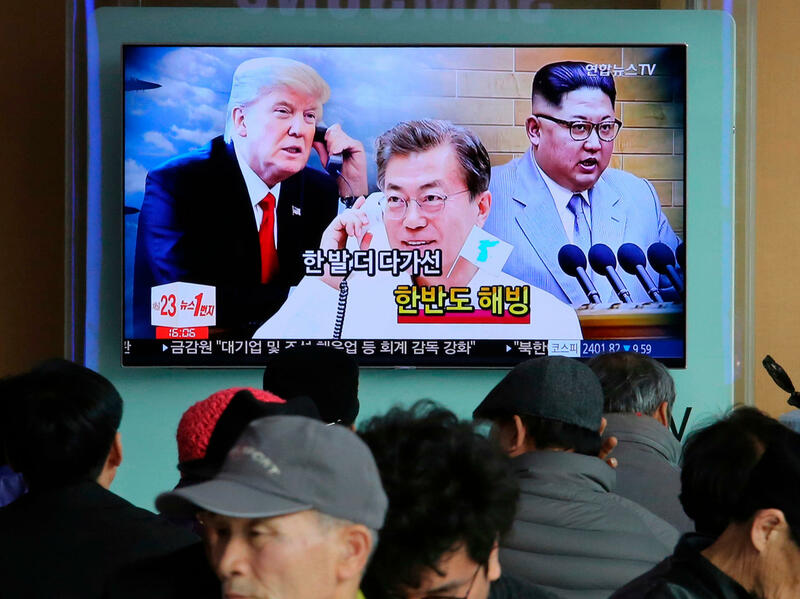 HU: Robert Kelly, a Korea specialist and professor at Pusan National University in South Korea, acknowledges Moon's difficult diplomatic dance. ROBERT KELLY: He's tried pretty hard to keep this whole thing on track. And, you know, he's got some difficult customers to deal with - right? - Kim Jong Un and Donald Trump. That's got to be quite (laughter) - that's got to be pretty difficult. HU: But he says ultimately, the problem heading into Singapore is the wide gulf between U.S. objectives and North Korea's. KELLY: The North Koreans are famous for all kinds of off-the-wall negotiating tactics. So I would like to see us just go a little bit more slowly so that this can all be sort of unfolded properly and we can understand the choices that are being made because I don't know if Donald Trump's going to get on top of all this in just three weeks. HU: Doing his best to help is Moon Jae-in, the only U.S. ally who has spent a whole day with North Korea's leader so far. Elise Hu, NPR News, Seoul. Transcript provided by NPR, Copyright NPR.